It has become increasingly clear: The Supreme Court has become another polarized institution in the polarized capital of a polarized nation. The tribalistic rituals of politics that have engulfed the halls of Capitol Hill have been firmly rooted in the judiciary for over three decades. What was once the great judicial equalizer has become a swamp for divisive, slanderous perjury. Progressives are a reliable indicator of what side of justice they are on if a court nominee is appointed by a president with an “R” instead of a “D” behind his name. Vetting everyone for a high court position is important. But using ad hominem character assassination for political gain is a slap in Lady Justice’s face. The progressive misuse of the Supreme Court is nothing new. The granddaddy of progressives, President Franklin D. Roosevelt, saw the court as an opportunity to eclipse all ethics of republicanism. When Congress trashed many of his dubious reforms, he reciprocated. Like all progressives, total control was his goal. FDR knew if he could control the Supreme Court, the left could control America forever. His plan was to increase the size of the Supreme Court by six liberal justices. If Congress didn’t approve his “raw deals,” the Supreme Court would. But it imploded as Republicans and Southern Democrats united against FDR’s court-packing scheme. As a result, FDR’s egregious assault against our republic went down in flames. The far left has always seen the Supreme Court as an opportunity to advance liberalism. After FDR’s failed attempts, they turned to personal assaults to win at all costs. Digging up archived dirt on a nominee began in defiance by the left when Ronald Reagan nominated Robert Bork for Supreme Court, in 1987. Bork subscribed to the theory of “original intent” of our Constitution as written in our founding documents. He felt judges had no right to make opinions by elastic interpretation that went against the ambition of Constitutional law. Bork served five years as a federal appeals court judge and had amassed a long paper trail of acute legal writings. 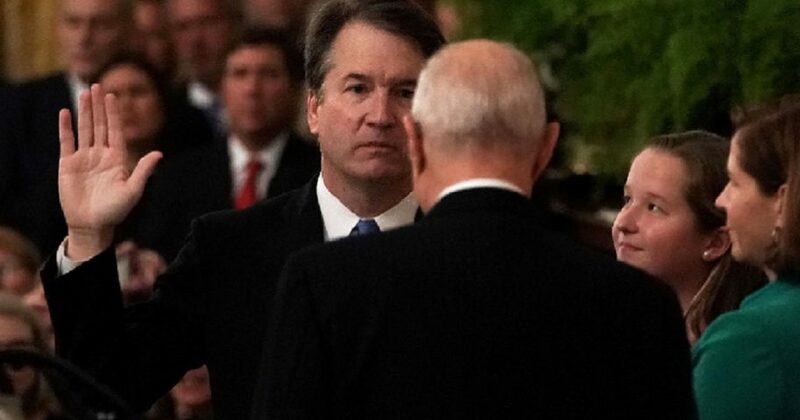 Do you think the left will continue attacking Justice Brett Kavanaugh? At the time of Bork’s nomination, the Democratic Senate had moved the party further left and saw Bork as an obstacle to take over the White House next election. Democrats were overtly concerned with his appointment because of his strict interpretation of the Constitution. And since Bork would have replaced Justice Lewis Powell, a moderate jurist who voted with the majority in Roe v. Wade, Bork became an instant threat. The left knew the best way to derail his approval was to discredit him in the court of public opinion. By the time they finished crucifying him, the Senate Judiciary Committee voted 9 to 5 against his nomination. He was then rejected in the Senate 58-42, the highest margin in American history. This public execution of Bork legitimized scorched-earth ideological political wars over nominees put forth by Republican presidents. Progressives made a mockery out of a once dignified, serious legal process for personal political gain. This was a fiendish, evil plan to publicly execute Bork long before he ever set foot into the Senate Judiciary Committee hearing chamber. They used Saul Alinsky’s best tactics to destroy a qualified former federal judge and ingenious legal theorist. Bork became a martyr for Constitutional law and a judicial hero. Political hypocrisy is a component of both parties. But nothing generates more of it than the left every time a conservative president names a Supreme Court Justice. How Republicans respect Democratic nominees and how Democratic senators scorn nominees from a Republican leader is shameful. After they defeated Bork with an all-out assault, they went after nominee Clarence Thomas in 1991. They had operatives looking under rocks for dirt to shame Thomas from contention. When they unearthed Anita Hill, who claimed Thomas made sexual advances toward her in the 1980s, this was a deliberate leftist political Hippocratic execution. Democrats ignored judicial qualifications to destroy Thomas personally. While some Republicans might not like all nominees from Democratic presidents, they have never engaged in character assassination to discredit them. Ruth Bader Ginsburg, the most liberal member of the Supreme Court, was confirmed 96-3. Stephen Breyer, who considers the Constitution “open to interpretation,” was confirmed, 87-9. Justice Sonia Sotomayor, a new-age liberal, was confirmed by a 68-to-31 margin. She received nine Republican votes. Elena Kagan, billed as someone who’d duel with formidable conservatives, was approved, 63-37. And five Republicans voted for her. The day Anthony Kennedy announced his retirement from the Supreme Court, calls poured in to D.C. from leftists accusing Donald Trump of “court-packing” if he chose someone whom they did not approve. And now the Senate has confirmed Brett Kavanaugh and the Supreme Court stands to be more traditional, the accusations will only grow louder as the midterm elections near. Since progressives can’t win elections on their merit, the discrediting of Kavanaugh gave them a stage to showcase their leftist docket and gain support from social avant-garde special-interests and their “under-classes” they created. Radical activist Saul Alinsky wrote, “Ridicule is man’s most potent weapon.” The process by which we elevate someone to the highest court in the land has fallen to the lowest common denominator and won’t stop there. To many leftists, these illegitimate tactics are justified since any progressive legislation in the future won’t survive a challenge in the courts if anyone but a leftist is positioned on the bench. Their concerns in question have less to do with hot-button social issues like abortion and LGBT rights and more to do with the unconstitutional regulation and redistribution of wealth. Progressives just set a new bar for judicial cynicism. They proved they have zero decency. However low the bar was set, it was not low enough. Progressives will not rely on cheap-shot theater and blood sport to assault America’s Judiciary. They must act scurrilously in public forums to teach their base Alinsky-style politics. The goal of programs like a $15 minimum wage and Medicare-for-all are too important to permit a Supreme Court to stop them. The hunt for an edge will go on. And no trick will be too dirty. There’ll be more attacks, more confrontation, more outrage and assaults against our system. Wake up, America. If you love our republic, it’s time to fight back. Progressives win by destroying. A version of this Op-Ed appeared on The Watchdog website.